A review of the National Archives of Cambodia (Phnom Penh, Cambodia). This brief assessment of the National Archives of Cambodia is based upon recent, two months long research at that location. The National Archives of Cambodia have been up and running (again) since 1995. Although the government funded website is not always available, Archivist Peter Arfanis published a general outline of the archival collections, which is available here. Hence, this review hopes not to replicate any of Arfanis’s information but rather looks at how one might gather information in these collections. 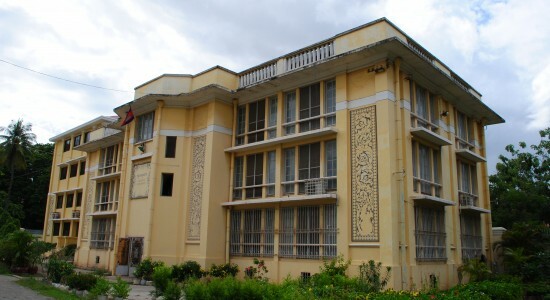 In general, even though the archives’ staff (headed by Director Y Dari) is incredibly helpful and friendly, new researchers might wish to browse through bound catalogues of the general collections in order to get a sense of their research terms before proceeding to doing more detailed computer searches or browsing through the journal collections. Bear in mind that the online search system at the archives is not up to date. It is reminiscent of mid to late 1990s technology (due to when the last available computer was procured). Nevertheless, the computer system does allow particularly easy, relatively fast access to collections of the archives, including the impressive Resident Superior of Cambodia collection (RSC). In order to access files from these collections researchers request a number of request slips. Pointing and stuttering: “sum…RSC?” will do the trick if you wish to demonstrate that you are at least making an effort to learn Khmer. Nevertheless, many of the older staff members are also fluent in French and the majority of the younger staff speak English with at least a working capacity. The reason why the RSC collections are particularly impressive is quickly apparent to that little historian inside anyone who might wander into the building in the first place, let alone to those who have an interest in all topics related to the history of Cambodia and the surrounding states of Thailand, Laos and Vietnam. Glancing across the pages, one gets a more intimate feeling for the paper-pushing of the eras of Sisowath (1904-1927) and Sisowath Morningvong (1927-1941). A close look will tell you who particularly accomplished translators were, the platforms of administrators and what forms of legislation they were promoting. The material in the RSC collections of the National Archives of Cambodia is most frequently concerned with keeping the behavior of the Oknha (subordinate provincial officials who have donated a certain amount of money to the royal treasury) and the Balat (assistants to the Oknha) in accordance with Royal policy. Further concerns are focused on keeping the movements of semi-international businessmen and the Chinese, Vietnamese, Malay and Cham minority communities under a certain amount of surveillance through binding them with taxation and educational policy. This would be particularly the case with the colonial era administrative constraints placed on educational policy that only afforded rights for “Burmese, Chinese and Malay” groups to hold private schools to support their language communities on the weekends. Hence, the educational policy that was established in the 1930s inherently supported an absorption of certain communities into others. One expects this would have been the case with the Cham in the colonial era as they would have forced to join Malay communal schools if they wanted even anything close to a Cham language education that was approved by the state. Close reading through the archival materials reveals not only Sisowath’s impressive handwriting, but also documents written in Jawi (Arabic script adapted to write everyday Malay and occasionally, in Cambodia, Cham). Unfortunately, to use the scanner in the archives is somewhat expensive and there is no other system for digitizing particularly impressive samples of the use of Jawi and Chinese characters combined with the occasional Thai royal documents that made their way into administrative decision regarding the borderland provinces of Battambang and Pursat, combined with the thousands of pages of manuscripts that range from clear samples of cosmopolitan early twentieth century Khmer discourse, through the more mundane matters of provincial arrests for avoiding tax payments, truncated ever so often by heated religious debates and river pirates. As these collections have still only been available to researches for a decade, there is still much work to be done in the National Archives of Cambodia. In large files it is common to find documents that might be better suited in another file, include slight misspellings of French language titles and slightly mislabeled dates. Nevertheless, the staff is very responsive to the suggestions of researchers regarding the re-categorization of certain documents if necessary and is happy to introduce researchers to the more detailed aspects of these archives. Although the official hours of the archives are from 8 to 10am and 2 to 4:30pm, the archivists generally allow researchers to stay in the archives a bit longer than the official opening hours. The archives occasionally are only open for half-days, when the staff for example meets to discuss how to continue improving the categorization and storage of the collections. The National Archives of Cambodia can be found on Street 61 (Oknha Hing Penn), directly next to the National Library Building, in-between streets 90 and 92 (very close to Wat Phnom). General costs for using the archives run at 15USD/month and 1USD/20 pages of photocopies. Print images are available from the incredibly impressive digital photo archive at a cost of 10USD per print. Finally, a large number of the collections present at the archives have been obtained from National Library of Cambodia and Buddhist Institute collections, making the National Archives of Cambodia the top public archival resource in Cambodia. Image: National Archives of Cambodia. Photograph by Author.